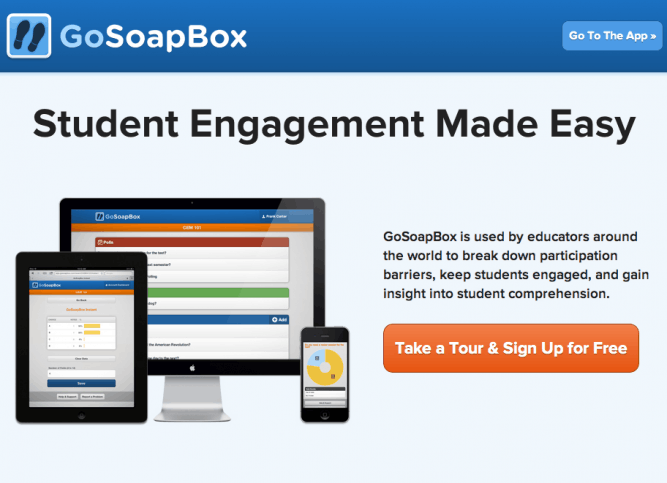 GoSoapBox is a webbased quiz- discussion- and evaluation tool, which can be used on both PC, Mac and smartphones. It makes it possible, in an easy way, to evaluate student learning, to engage students and to create dialogue in the classroom. The tool combines the functions of tools like TodaysMeet and Socrative, and is suited for use within a monological and a dialogical form of teaching. In the monologic form of teaching, GoSoapBox can be used by the teacher to ensure, that the learners have understood the key concepts of the subject. It may for example be by means of a quiz, which students must answer individually using their computer or smartphone, after which the teacher can see which students have responded correctly to the questions. This use of the application offers a good opportunity to evaluate and organise teaching, so that all learners reach the learning objectives. In the monological form, it is also possible to use the function ' Social Q&A ', which allows the learners can ask questions to the teaching – both to the instructor and to each other. This function is similar to that of TodaysMeet, but GoSoapBox, however, provide space for 250 characters in each post, where Today Meet only leaves room for 140 characters. In the dialogical form of teaching GoSoapBox can be used as a springboard for dialogue on class. The teacher can put a written question to the class (the ' Discussion '), and ask the learners to write their individual answers to the question in the Soap Box. The answers will then be shown on the Board (it is possible to make responses anonymous, which can ensure that more dare utter it), and a dialogue can be started around the answers. It is not free to use GoSoapBox (it costs from $7.50 per month for one teacher), but one has the opportunity to try it out and assess, if one finds it better than a combination of the free tools TodaysMeet and Socrative. Besides the introduction one gets when registering on the site, there is help and instructions available here, if you wish to try GoSoapBox .